Hair and Fur is a compnent of many flies. Selecting the proper type is crucial to achieving good results in tying. To discern a quality hair patch, look for straight hair without much curvature. Any curvature will be difficult to use especially for wings and tails. Also look at the hair tips to ensure they they are not broken. Often, a stacker will be used to even the tips to make a neater appearing fly. There is a natural underfur to most hair patches. This underfur needs to be combed out before stacking. It will decrease the bulk andallow the hairs to be manipulated more easily. You will also find different degrees of texture within hair. Some hair is hollow and will be easier to spin around the shank. Other hair is dense and will support the fly better on the water surface. Calf Tail, also known as Kip Tail, can be 3/4 to 2 inches in length. It has a crinkled characteristic. Try to purchase calf tail that is fairly straight, dense, and has an even diameter. The natural calf tail is white but it is often dyed into a number of colors. Do not use the wavy hair at the tip of the tail. The best hair is from the mid-point of the tail to the base. You can use a small wire brush to help straighten the crinkleness and to help clean up the fibers. Some tiers will roll the hair between their fingers to help straighten it. Mostly used for dry fly wings such as Trudes and Wulff flies and parachute flies. You may also find the material used for some tails and streamer wings. Use a stacker to even-up the tips. Some tiers prefer to use calf body hair since it is straighter and easier to work with. This can be particularly true for flies that are smaller than #12. Bucktail is the tail from a white-tailed deer and can come in a number of lengths. Often, the medium length material is used for wings on Sierra streamer patterns such as Clouser Minnows. 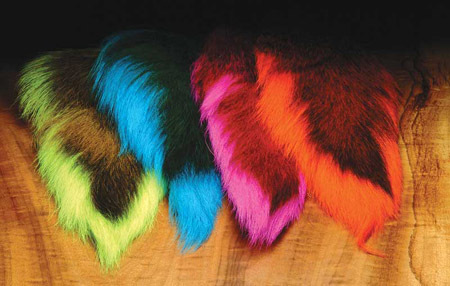 Hareline markets a Large Northern Bucktail that is 3-4 inches in length and dyed in a number of colors. The natural bucktail will be white with brown hair down the middle. Try to select tails with straight hair. The upper 2/3 of the tail is finer and will make better wings. As you use hair closer to the base, it will be thicker and will tend to flare and be brittle. 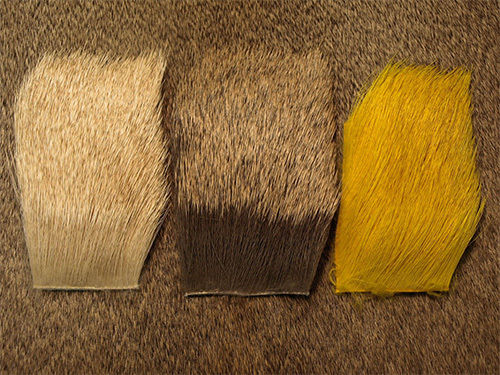 Coastal Deer Hair is a medium texture of 1/2" to 1.5" in length with very little underfur. The hair will flare to a limited degree (~45 degrees) and is used for caddis wings and small comparaduns down to #20. Hareline carries four types: Natural Medium, Natrual Dark, Bleached, and Dyed Black. There are also dyed colors of Grey and Olive available. 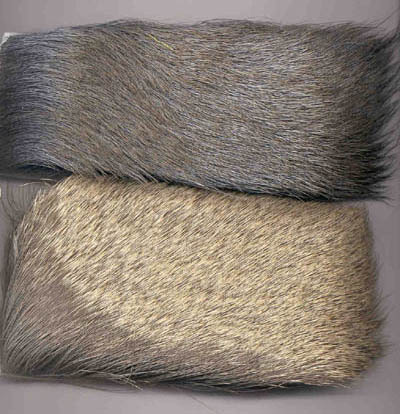 Mule Deer is a coarse textured hair that will flare to 90 degrees and is good for bass flies and muddlers. It is 1.5 to 2.5 inches in length. The hair is hollow from the base to the tip where the color changes. This allows the hairs to be spun tightly and for ease of dying to many different colors. 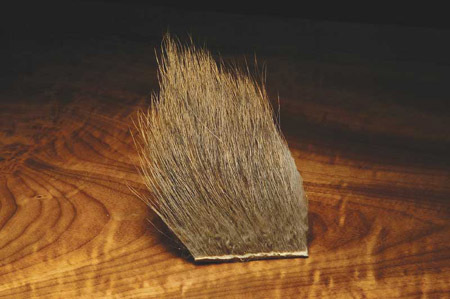 Texas Whitetail is finely textured hair 0.75 to 1.75 inches in length. It has a micro hair that extends beyond the tip and does not allow for stacking. The hair is only hollow in the bottom 1/3 so that there is virtually no flare. It is great for tails and downwings such as Caddis. Bull Elk has a medium texture, with long pale gold tips. 1.5 to 2.5 inches in length, this hair is great material for winged flies sized 12 and up. Also sold as light elk. It is used on numerous dry flies such as wings on Elk Hair Caddis and wings and tails on blonde Wulffs. Some tiers prefer it over deer for small Compara-duns. Elk is more hollow at the tips and easier to tie in without bulk. Bull elk can be good for extended bodies too. It is the most durable of the "hollow" hairs. Sold in a Natural Gold with gray butts, Bleached, and dyed over colors. 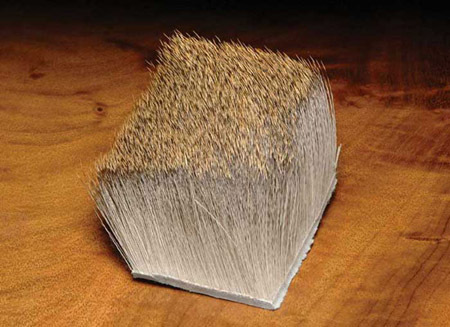 Cow Elk has a medium coarse texture with a steeply tapered tip. It has excellent spinning properties, a heavier diameter than deer, and is three times more durable than deer hair. Also sold as dark elk. It has sand tips with a gray color through the rest of the fiber. It is used as dry-fly wings. 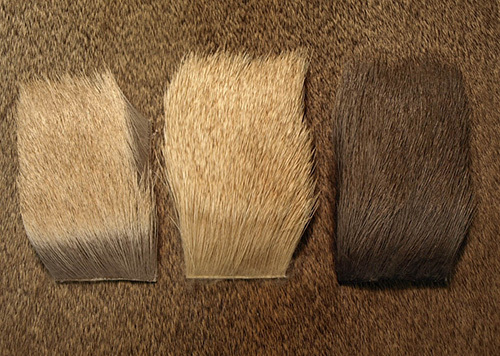 Elk hair is more difficult to flare than deer, but it is more durable, especially for deer on Humpys and bullet-head dries. Sold in Natural Brown, Bleached or dyed over colors. The texture and length of this hair makes it a favorite for tying Humpies and Goofus Bugs. Due to the age of the animal this immature hair is about half the diameter of a mature Cow Elk. Only after its second winter does the hair become fully mature. Yearling Elk has well defined tips which enables the tyer to tie a great range of hair wing flies from 8 - 24. Plus, it has very good spinning properties. This medium textured hair is 1.5 - 2.5 inches in length. This is the mane from a Bull Elk. It is a fine texture and long length of 3-6 inches. It is used on dry fly tails and can also be wrapped as a body. Elk Mane is also very buoyant and has enough flare to be used a backwings on caddis dries and stoneflies. 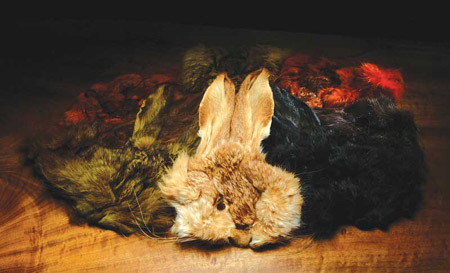 A hare's mask has a wide variety of shades and is dyed to a number of colors. A mask will give you a number of fur textures from coarse guard hairs for tailing and legs to soft underfur for dubbing tight tapered bodies. Guard hairs are often combined with the underfur to produce a buggy look. He uses the fur from the ears for dark bodies of Duns and the dark thorax areas of nymphs. Between the ears, the crown of the mask is softer and longer. This area also has a lighter sandy shade of fur with whitish tips. Davy uses this area for many dry fly bodies and nymphs. At the base of the ears, the fur is longer, coarser, and dark. Using a 50:50 blend of this fur with that from the ear, Davy uses this blend for Dry Caddis patterns. On the sides of the mask on each side of the eyes, Davy uses this fur for his Hare's Ear Nymphs. The fur tends to be a lighter shade and a little stiffer. Colors: Black, Olive, Rust, Dark Brown, Gold, Dun, Bleached, and Orange. 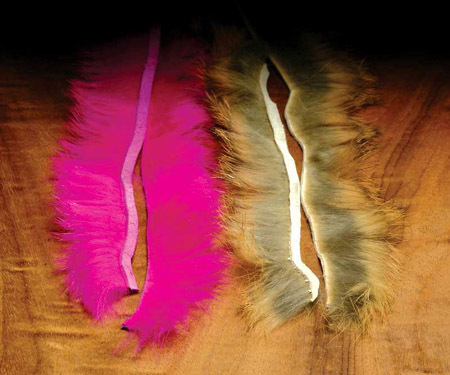 Long, thin strips of rabbit skin with fur attached. Used for zonker-type streamers. Dyed to a large assortment of colors.